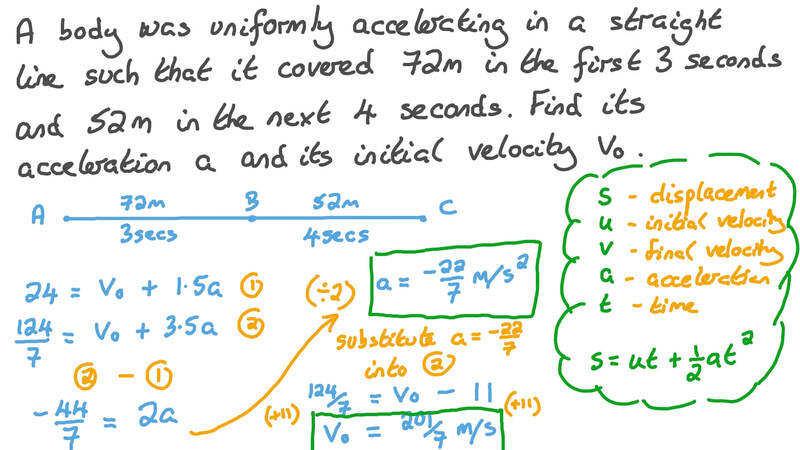 In this lesson, we will learn how to solve problems involving the average velocity in an nth second of a particle moving in a straight line. A body was uniformly accelerating in a straight line such that it covered 72 m in the first 3 seconds and 52 m in the next 4 seconds. Find its acceleration 𝑎 and its initial velocity 𝑣 0 . A particle is moving in a straight line accelerating uniformly at 1 m/s2. Given that its initial velocity 𝑣 0 was 21 m/s, find its displacement 𝑠 during the time interval between 𝑡 = 7 and 𝑡 = 1 3 s e c o n d s .
A body, moving in a straight line, accelerated uniformly such that it covered 35.5 m in the second and 53.5 m in the one. Find the acceleration of the body and its initial velocity . A particle is moving in a straight line with an initial speed and a uniform acceleration . Express its average velocity during the , , and seconds in terms of and . A particle started moving in a straight line from rest. Accelerating uniformly, it covered 135 cm in the 2 n d , 3 r d , and 4 t h seconds. Find its acceleration 𝑎 and the distance 𝑑 required for the particle to reach a velocity of 45 cm/s. A particle was moving in a straight line with a constant acceleration. Given that it covered 23 m in the 5 t h seconds and 56.5 m in the 8 t h and 9 t h seconds, determine the particle’s acceleration 𝑎 and initial velocity 𝑣 0 . A particle started moving in a straight line. Its initial velocity was 35 cm/s, and it accelerated uniformly at 11.5 cm/s2. Find the distance covered by the particle in the 9 t h and 1 0 t h seconds. Near the surface of the moon, the distance that an object falls is a function of time. It is given by 𝑑 ( 𝑡 ) = 2 . 6 6 6 7 𝑡 2 , where 𝑡 is in seconds and 𝑑 ( 𝑡 ) is in feet. An object is dropped and falls for at least 3 seconds. Calculate the average velocity of the object from 𝑡 = 1 to 𝑡 = 2 . A body was uniformly accelerating in a straight line such that it covered 68 m in the first 4 seconds and 57 m in the next 6 seconds. Find its acceleration 𝑎 and its initial velocity 𝑣 0 . A body, moving in a straight line, accelerated uniformly such that it covered 39.5 m in the second and 58.5 m in the one. Find the acceleration of the body and its initial velocity . A particle was moving in a straight line with a constant acceleration. Given that it covered 19.5 m in the 3 r d seconds and 52.5 m in the 5 t h and 6 t h seconds, determine the particle’s acceleration 𝑎 and initial velocity 𝑣 0 . A particle started moving in a straight line. Its initial velocity was 64.5 cm/s, and it accelerated uniformly at 10 cm/s2. Find the distance covered by the particle in the 4 t h and 5 t h seconds. A particle is moving in a straight line accelerating uniformly at 4 m/s2. Given that its initial velocity 𝑣 0 was 7 m/s, find its displacement 𝑠 during the time interval between 𝑡 = 3 and 𝑡 = 6 s e c o n d s .
A particle started moving in a straight line from rest. Accelerating uniformly, it covered 108 cm in the 4 t h , 5 t h , and 6 t h seconds. Find its acceleration 𝑎 and the distance 𝑑 required for the particle to reach a velocity of 64 cm/s.